Previously having worked in Ascribe, Genesis Automation Healthcare and Wolters Kluwer Health, Nadine brings her vast sales and marketing knowledge of the healthcare information industry, and especially the NHS. 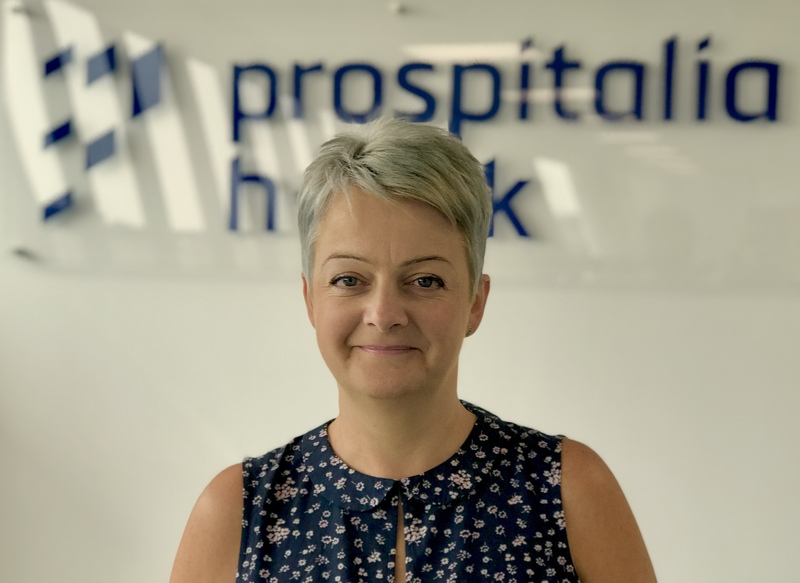 Her appointment comes at a time of growth as Prospitalia h-trak is implementing the h-trak procedure costing system into several NHS trust hospitals. In her new role, Nadine will manage the expanding pipeline of new business as well as supporting the Operations teams to ensure that these implementations are delivered to the customers satisfaction. Managing Director, Prospitalia h-trak, Kirk Kikirekov, welcomes Nadine to the team. ‘Nadine brings a wealth of business development and commercial acumen to this position, and I am confident that she will make a very positive contribution to our business in all respects. Nadine’s approach to understanding the customer needs, and of the business in a holistic sense is closely aligned to the Prospitalia h-trak ethos. This approach will ensure that our customers will achieve a high ROI from implementing the h-trak system’. Nadine commented, ‘ I’m delighted to be joining the Prospitalia h-trak team at this time of growth and expansion for the company. I’m excited about the future and being part of a management team who are so exceptionally experienced in providing solutions to the healthcare industry both in the UK and abroad, and in bringing my knowledge and experience to a company who has both the customer and the patient at the centre of everything they do’. Prospitalia h-trak provides integrated procedure information that enables NHS hospitals to achieve cost savings and process efficiencies. Using barcoding and mobile data capture technologies, the h-trak system accurately identifies products used in surgical and interventional procedures, to provide a rich source of procedure information. Finance, Clinical and Procurement managers can use the data to review performance, make informed decisions and automate functions, such as purchasing. Since commencement, more than 1.9 million procedures have been captured through the system worldwide. Prospitalia h-trak is part of the Prospitalia Group, Germany’s leading GPO in the healthcare market, with a purchasing volume of 2.4 billion Euro. This press release was distributed by ResponseSource Press Release Wire on behalf of Prospitalia h-trak in the following categories: Health, Medical & Pharmaceutical, Public Sector, Third Sector & Legal, for more information visit https://pressreleasewire.responsesource.com/about. Providing integrated procedure costing information, using barcoding and mobile data capture technologies, that enables hospitals to achieve efficiencies and cost savings.